The KOA 330Ohm 0603 Thick Film Resistor ±0.1%, 0.125W, available now from RS Components, is a metal-glaze thick film resistor for surface mounting. The device is a high precision resistor with T.C.R. ±25×10-6/K and tolerance ±0.1%. The device offers high reliability with ΔR of ±0.2% and ±0.4% in the reliability test. The resistor is suitable for both flow and reflow solderings. 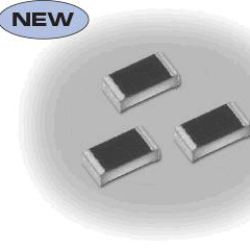 Surface mount fixed resistors are employed to decrease the flow of electrical current in circuits. The devices work to a set value that cannot be altered. Due to their compact size and features that provide for easy soldering, surface mount fixed resistors are ideal for smaller circuit boards and prototype designs with limited board space. The resistors are frequently used for the mass production of electronic equipment, especially mobile phones and televisions. They are also located in commercial telecoms equipment and advanced technology research instruments.